Put Me in a Plastic Bubble! 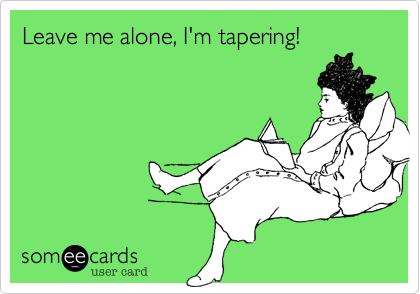 I’m Tapering! | So What? I run. Why is it that everytime I get close to a race that’s important to me EVERYONE around me is sick?!?! The folks in the office are sick…almost ALL of them, my nephew is sick, and last night my husband tells me he is sick, AFTER I gave him a quick kiss. He said, “uh-oh…forgot to tell you I’m getting sick. I have a sore throat.” WHAT?????!!!! Are you kidding me?! Couldn’t tell me this BEFORE you gave me your germs? If my cacluations are correct, there’s a three day incubation period, which means I should start to feel it around Friday. Then it’ll take me a week to 10 days to get over it. This in turn means, I’ll be too sick to get my last runs in, I won’t eat right, and I’ll be exhusted for the Marine Corps Marathon. Everywhere I go, someone is hacking without covering their mouth or sneezing and contaminating my air. I need a plastic bubble that I can hide in until race day so that I can stay healthy. This entry was posted in Marathon Training and tagged Marathon Running, Marathon Training, Marine Marathon, Running, tapering by SoWhatIRun. Bookmark the permalink. My boyfriend did the same thing to me!! Hope you manage to stay healthy before your race! Why do they do that!? Thanks! Loading up on any and all immune boosting concoctions. Ok, this is what I do. 2 weeks out from a big race, MCM for me this time too..I start taking emergenc-e twice a day, echinacea and zinc, probiotics, and elderberry twice a day until race day. I have been able to avoid all sickness even when the kids are draining and wiping snot everywhere!! So far it has worked for me..knock on wood! Ok this is what I do….two weeks out from a big race (MCM for me too) I start taking Emergenc-E, zinc, echinacea, probiotics and elderberry daily. So far it has worked for me despite my kids wiping snot everywhere! I swear by it!! If you don’t have any symptoms yet, this should keep them at bay if you stick with it until race day!! Fingers crossed for you! My boys are dripping snot machines right now, so I am in the same boat! !